Fixed hour prayers are prescribed religious obligation for all adult faithful Muslims. it is perhaps surprising to many that the same principle of fixed hour prayers exist in Bible as well and were part of Judio-Christian practice. The Divine Hours: a brief history of fixed-hour prayer is a resourceful article by Phyllis Tickle which explores this subject. Quoted from Explore Faith website. The Age of the Apostles | Fixed-hour prayer, while it is with the Eucharist the oldest surviving form of Christian spirituality, actually had its origins in the Judaism out of which Christianity came. Centuries before the birth of Jesus of Nazareth, the Hebrew psalmist wrote that “Seven times a day do I praise you” (Ps. 119:164). Scholars differs on the hours of early Judaism’s set prayers (they were probably adjusted and readjusted many times). By the beginning of the common era, Judaism and its adherents, already thoroughly accustomed to fixed hours for prayer, were scattered across the Roman Empire. ... The first detailed miracle of the apostolic Church, the healing of the lame man on the Temple steps by Sts. Peter and John (Acts 3:1), occurred when and where it did because two devout Jews (who did not yet know they were Christians as such) were on their way to ninth-hour (three o’clock) prayers. Not many years later, one of the great defining events of Christianity - St. Peter’s vision of the descending sheet filled with both clean and unclean animals - was to occur at noon on a rooftop because he had gone there to observe the sixth-hour prayers. The directive Peter received during his noon devotion-i.e., to accept all that God had created as clean-was pivotal because it became the basis of the ecumenism that rapidly thereafter expanded Church fellowship beyond Jewry. Peter was on the roof, however, not by some accident of having been in that spot when the noon bell caught him, but by his own intention. In Joppa and far from Jerusalem and the Temple, Peter had sought out the solitude of his host’s rooftop as a substitute site for keeping the appointed time of prayer. From the Apostles to the Early Fathers | As Christianity grew and, thanks to Peter’s rooftop vision, as it spread, so too did the practice of formalized daily prayer. The process by which the fixed-hour prayers of the first century slowly recast themselves as the Divine Hours or Daily Offices of later Christians is blurred in some of its particulars, though we can attest to the approximate date and agency of many of them. We know from their writings that by the second and third centuries the great Fathers of the Church- Clement (c. 150–215 a.d.), Origen (c. 185–254 a.d.), Tertullian (c. 160–225 a.d.), etc. - assumed as normative the observance of prayers in the morning and at night as well as the so-called “little hours” of terce, sext, and none...or in modern parlance, nine a.m., noon, and three p.m. These daily prayers were often said or observed alone, though they could be offered by families or in small groups. From St. Benedict to the Middle Ages | Once the notion of unbroken and uninterrupted prayer had entered monastic practice, so too, almost by default, did much longer prayers enter there. Yet for all their lengthiness and growing complexity and cumbersomeness, the monks’ fixed-hour prayers became normative for the religious in both the Eastern and the Western branches of the Church. By the fourth century, certainly, the principal characteristics of the daily offices as we know them today were plainly in place, and their organization would be more or less recognizable as such to us today. From the Middle Ages to Us | As the keeping of the hours grew in importance to become the organizing principle of both Christian spirituality and the Christian day, so too did the elaboration of the offices. 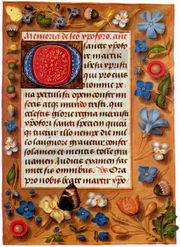 By the eleventh century, saying an office required a veritable stack of books ... a Psalter from which to sing the Psalms appointed for that day and hour, a lectionary from which to ascertain the appointed scripture reading, a sacred text from which to read the scripture thus discovered, a hymnal for singing, etc. Despite all the diversity that centuries and evolving doctrine have laid upon them, the Divine Hours have none the less remained absolute in their adherence to certain principles that have become their definition. ... partly quoted. read the full article here.